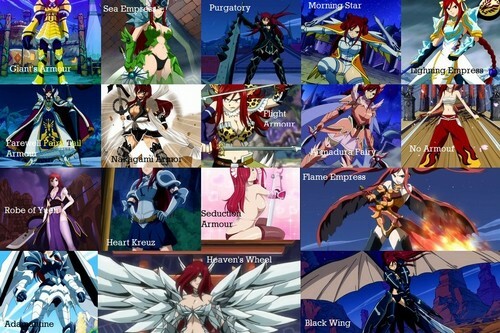 All Erza's Armours and their Names. Collection of all Erza's armours shown yet. It took some time to complete but I had fun making.. HD Wallpaper and background images in the Fairy Tail club tagged: photo erza armour armor giant's armor nakagami armor black wing seduction armor morning star armor flight armor heaven's wheel flame empress lightning empress sea empress farewell fairy tail fairy tail. Collection of all Erza's armours shown yet. It took some time to complete but I had fun making.